See what people are saying about The Brambles residential and day support programs. I would like to thank all the staff, managers, nurses, day support staff, and Mary and Clyde for all that they do for their clients. We have been so pleased with the support that Blair has received in the last year. The help, love and genuine care has been overwhelming. We are truly blessed. Tripp and I talked last night coming home from the chili cook-off about the community atmosphere. How all are integrated into that community spirit and how this was not the experience that Blair had when she lived in Chesterfield. We just beam at the outpouring of love and affection that runs through the community and are thankful that she is a part of it. Have a wonderful Thanksgiving. You all are angels on this earth. God Bless. This is late in coming but want to thank you for the beautiful setting you have provided for the town of Mathews in your purchase of Dr. Hodgins office. You have done such a fabulous job and I so look forward to viewing it daily. It is always such a delight to point it out as I am showing property. Comments are always complimentary. Thank you so much from an old friend and proud citizen of Mathews! 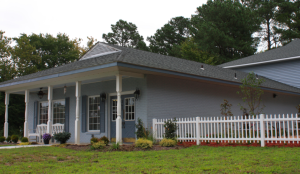 Formerly a physician’s office, the Brambles day support center serves ID adults from Mathews and surrounding counties. Do you have a Brambles testimonial to share? Contact us and submit your story.